A Bridge Too Far (1977) or A Movie Too Long? Richard Attenborough’s A Bridge Too Far has, with some reason, been called a movie too long. Yes, I must admit I was tempted not to pause it when I needed to go to the bathroom. But then again… This is not doing it any justice because it has a lot of fine elements. For a start, what I am really enthusiastic about is the re-enacting. Nowadays it is all CGI but when they did A Bridge Too Far they had no choice but have people jump out of planes with their parachutes. And this is so beautiful. The scene where they jump is almost ethereal and all those hundreds of parachutes look like ever so many jellyfish. But there the dwelling on beauty ends, too horrible is the end of those frail looking creatures. Is there anything more helpless than a man hanging from a few ropes being shot at? Operation Market Garden has been one of the biggest planning mistakes of WWII. What could have been a successful multinational cooperation turned into a farcical disaster. Two generals, one British (Montgomery), the other American (Patton), were so full of themselves that their egos put aside any consideration of a possible failure. Moreover Montgomery totally underestimated the German’s strength. 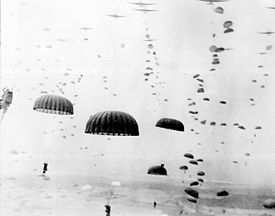 35000 paratroopers were to land in Holland behind enemy lines. The idea was to secure three bridges, push back the German troops, invade Germany and end the war. While holding the bridges, the troops should have been reinforced by tanks. Unfortunately they forgot to provide supply lines for the paratroopers, the armored troops were held back and died on what was called “Hell’s Highway” and civilians got in between as the operation collapsed. This movie is probably one of the most famous war movies of all times. It is an all-star cast, like The Longest Day, starring Robert Redford, Ryan O’Neil, Gene Hackman, James Caan, Michael Caine, Sean Connery, Anthony Hopkins, Laurence Olivier, Dirk Bogarde, Maximilian Schell, Hardy Krüger and many more. A Bridge Too Far shows, like The Longest Day, a big operation from different points of view. I was not equally keen on all the actors but was impressed by Anthony Hopkins whose despair at the end is painfully obvious. He plays the role of Lt. Col. Frost whose troops had to defend Arnhem Bridge. The end of the movie is one of the saddest in war movie history. The troops are either defeated, taken prisoners or killed. A Bridge Too Far is a tragic illustration of what can go wrong when egotism meets bad planning and how the price is ultimately only paid by those who must follow orders. As I stated before it is a tad long but it will always remain one of the most important epic war movies and you should watch it if you haven’t done so already. This entry was posted in Actors, Big Battle, History, Reviews, Trailer, War Movie, WWII and tagged A Bridge too Far, Big Battle, History, Infantry Combat, Movie Trailer, Movies, Operation Market Garden, Reviews, Richard Attenborough, War Movies, WWII. I stilll have to read your review but I will. I still love watching this movie again & again. I will watch it again very soon too. Looking back I have forgotten about the length, it’s a minor flaw compared to the outstanding rest. I really liked the re-enactment. I’m (unfortunately!) old enough to have seen this in the cinema as a 13 year old in 1977 and it blew me away at the time. I now have the DVD and it’s an epic. For some reason it’s never really gained the status that other lesser films have, despite it’s incredible cast list. The action is well staged and the locations look and feel authentic. You can’t watch this movie and not be moved by what these men went through, on both sides. There’s no glorification of war in this one. It’s brutal, truthful and incredibly well presented. For me it remains one of the greatest war movies ever. I’ve seen a lot of war movies since I reviewed this and it does stand out, I agree with you. THis and The Longest Day are some of the most amazing regarding the cast. Both are certainly better than a lot of what is produced now. I know I found it long when I watched it but meanwhile I’d like to watch it again. Should be a great movie to see in a cinema. I saw it in the cinema when it came out and, though a long movie, it never felt that way. The action more than kept the interest going, and the fact it was a true story made it all the more poignant. Mind you, I have the feeling there may have been an intermission half way through it, as they often had in those days if a movie was longer than 2 hours (there would also have been a ‘b’ movie shown with it, so you certainly got your money’s worth!). But of course the magic of DVD is you can stop it and come back another time. It’s a vastly underrated movie compared to others. I love your blog by the way, I’m a real war movie fanatic and it’s been great reading your views on the subject. I only discovered you yesterday but am really impressed with what I’ve read. Many thanks! I paused it once or twice. I think people interested in war movies value it for what it is – a very realistic film with great actors. Thanks for that very nice comment. I’ve not been as active recently as I used to be but that’s largely due to a streak of bad luck with my movie choices. The blog should be more regularly updated within a couple of weeks. Do you have a favourite war movie? Yes, I would have to say ‘Where Eagles Dare’ is my favourite, followed by ‘Kelly’s Heroes’, Yes, the plots are far fetched to say the least and make the German Army look inept (which they most certainly were not in real life!) but for a good old fashioned ‘boy’s own’ style adventure, you can’t beat them. I think I know the dialogue off by heart in both lol. In the more ‘believable’ category I would think ‘Cross Of Iron’ and ‘Enemy At The Gates’ are hard to beat. I liked Where Eagles Dare but I haven’t seen Kelly’s Heroes. Cross of Iron makes my Top 20. My favourites are Stalingrad, The Thin Red Line (I know many hate it), When Trumptes Fade and Black Hawk Down. Enemy at the Gates is great as well. All great movies. My only criticism of ‘Stalingrad’ is more of the DVD version I have than the film itself, as it’s dubbed into the most ridiculous English with German accents I’ve ever heard in a movie. I would much rather watch with the original German and added subtitles, but there’s no option on my copy sadly. But as a movie it’s wonderful, and very tragic. I’ve seen clips of a recent German TV production called ‘Unsere Mütter, Unsere Väter’ and it looks absolutely stunning, and another well worth looking out for. Well here’s a confession for you – I’m a native French/German speaker, so every review of a French or German movie has to be read with that in mind. I won’t read the subtitles, nor watch the dubbed. Accents are very important. And I’ve seen good movies completely spoilt bad bad accents. The dubbed version you saw sounds dreadful. I hope you can try it again someday in a subtitled version. Yes, it would be great to see ‘Stalingrad’ in its original form. The makers of the DVD should be sued by the German makers to be honest. But it was still an overpowering movie all the same. It’s too bad they did that as the actors are outstanding and seeing a dubbed version takes away from that. Agree. Commendably accurate without silly subplots like in “Midway” (a similar effort). An underrated movie that inconveniently came out right when Hollywood was making its transition away from epics and to cynical depictions of war as exemplified in “The Deer Hunter”. Personally, I regard “A BRIDGE TOO FAR” to be just as cynical as “THE DEER HUNTER”. In a movie like that, one would expect it to end on a similar way as “THE LONGEST DAY”. Instead, it ended with defeat. Not sure I understand what you are saying. It’s a historical fact while The Deer Hunter is fictional.